Everyone purchases packaged products. Heck, we purchase them every day, whether packaged in corrugate, plastics, shrink wrap, etc. We also know that many times, perhaps when you look on the bottom or sides of the package for an expiration date , you see that the packaging and printing has been scuffed and smeared – likely from the conveyor belt the product was packaged on when the product was accumulated at the end of the line or at a transition point in the process. Or maybe a box has been dented due to products behind it in the production line banging into it at an accumulation point. Sure, most products aren’t majorly affected by this, but some definitely are. And with all the time and money that manufacturers put into the design and branding of the packaging, handling the product with care is a must! One solution to this common problem is using roller-top belts on your conveyor in areas where the product will be accumulating, while the conveyor is still running. Roller top belts are usually used in low back pressure accumulation and side transfer conveyor applications. Because of the very low friction between the conveyor belt and the product, producers are able to let the products accumulate safely and the product is much less likely to become damaged either by colliding packages or the belt scuffing the bottom or sides of the package. Purely for demonstration purposes, we shot this video using a QWIK 5200 Series plastic chain conveyor from a recent order. 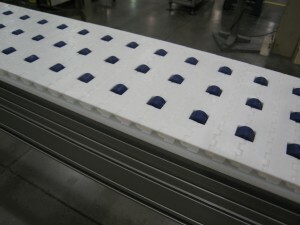 To show just how little friction there is using a roller-top conveyor belt, we loaded 3 lb. 14 oz. boxes on it and pushed them in the opposite direction of belt travel. Protecting your product is not the only advantage from roller-top belts. Because of the low friction, there’s also a reduced load pressure and wear on the belt as well as other conveyor components. This means you’ll likely see longer belt life, lower power consumption, and less wear on the bearings, gearmotor, and reducer.